171119: Antua, Maite, Gotzon, Josu, Oier. Europako Galtzerdixa, aurreragokuan Xabik topautako arrakalia. Espatula kolpe bakarrakin, eta mailluakin, pasatzia lortu dogu. Xabin estimaziñua ona izan da; 10 bat metrotako tximinixa bertikal baiña destrepablian ostian, potzuak baioneta kiebro bat egitten dau, eta plataforma bateraiñok allegau gara, espeleotema gaiñian, eta handik behera bikoizten zan potzu bat, alde baten estua-destrepablia, bestia nasaixagua-sokia bihar zana. Dana arrakala baten fabore zabaldutako sistematxo bat, guztiz fosilla eta espeleotemak deuseztatze fasian. Hortik behera, guztiz lurrez betetako hondo batera allegau gara, eta han barriro beste potzu paralelo itxurako arrakala baten goiko partia; ranpan behera eta bertikalian, bi jarraipen posible, bixak estuak, eta ezelako haize korrienterik barik. Hortxe laga dogu, eta gora. Bio aldetik, masma txiki bat, Meta bi eta Oxychillus bat. Gaur Aranbarrena (Markina)-ra joan gara. Emozioz beteriko irteera. Josuk sistema handiak esploratzera joateko inbitazio bati ezezkoa esan zion. Urdaibai aldetik tropa etorri zen. Kobazuloaren sarrerak duen airearekin emozionatuta, gaur esplorazio handiak espero ziren: galeria handi amaigabeak, formazioz beterik, eskaladak nonnahi igotzeko eta putzuak nonnahi jeisteko. Kilometroak espero ziren. Aranbarrena zabaldu genuenean, desobstrukzioan harriak kentzen genituenean, harri bakoitzeko "Goikoetxe", "Goikoetxe",... esaten genuen batzuk. Gero pentsatu nuen "Europa Lezia-ra, Aranbarrena hor egonda??". Bebai esan genuen, "txo, guazen Aranbarrena zabaltzera ze bestela datorren urtean berriro Galarregi-ra joan beharko dugu..."
Ba bihar Europa Lezia ingurura goaz. Eta ez, momentuz ez goaz Galarregira, eta ez dago joan beharrik ere, zeren eta uste dut zerbait oraindik txarragoa aurkitu dugula. Uste dugu La Caja de Pandora zabaldu dugula. Airea hor dago. Baina oraindik mendi madarikatuak ez digu esker onik ematen. Fraktura estuak eta basatzak bakarrik erregalatzen dizkigu. Batzuetan, salatxo bat erakusten digu, eta salatxo hortan "zutik" ahal gara jarri, eta argazkiren bat atera, eta sabaia eta hutsunea kontenplatzen dugu, eta gogoratzen gara zelako ederra den espeleologia zutik jarri ahal garenean. Baina hori da, hori eta airea, jarraitu erazten digun karameloa. Baina gero... zasca! Berriro paso estua. Eta koba aurrera doa. Gaur egingo genituen beste 100 metro? Han doa Zapola mendiaren barrenera. Pasadan hilean Kanteratxiki deitutako lekuaren azpian geunden plantan, baina dagoeneko kanterako Semaforoaren azpi inguruan egongo ote gara? Josu eta Martin fondoan fraktura estuetan sartuta ibili dira. 100 bat metro egin omen dute fraktura estutan. Baina leku batzuetan ia gorputz guztia busti behar omen da. Beste batzuk paso estuekin burruka latzean ibili dira. Beste batzuk fraktura bertikaletan oposizioan. Goiko aldean salatxo batzuk ere bazeuden formazioz beterik. Baina bueltatuko gara. Zeren eta azken finean, metroak ematen ari da, eta mendi barrura badoala esaten ari zaigu, hori bai, ze morfologian? Artibai aldera ura botatzen duten koben analisi morfologikoek ez digute sorpresa handirik ematen. Geologoek esaten duten modura: "estamos ante entornos poco karstificados con alta concentración de sedimentos en disolución". Article written in april 2017, published originally in basque language in Karaitza magazine, number 24, pages 64-55. Spanish translation here. 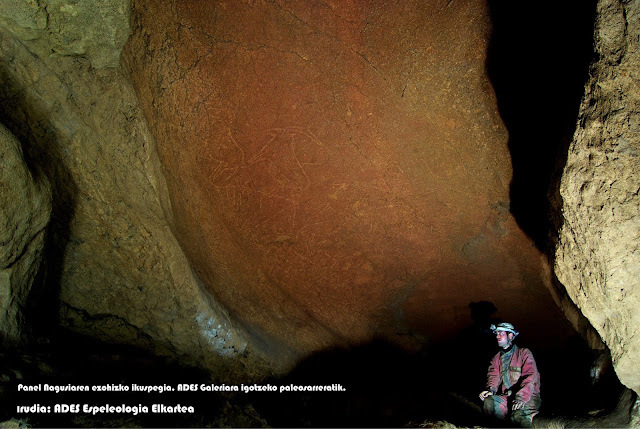 In 2016, the discovery of an exceptional collection of parietal art put the cave of Armintxe (Lekeitio, Biscay, Spain) on the international archaeological map. This article presents what we know so far about this cave, as well as the conflict between Administration, archaeologists and speleologists, which is keeping the exploration paralysed at this time. The cave of Armintxe is situated in the North Biscay Anticlinorium, more precisely in the north-eastern zone of the anticline, in the sector corresponding to Nabarniz-Aulestia. The karst in this area presents fractures in different orientations, and in this zone it is characterized by a large number of fractures and folds of orientation either parallel, perpendicular, or oblique to the main structure. The cave is mainly orientated NW-SE and develops along a fracture that follows the principal tectonic of the anticline, in materials of the Urgonian facies of the Early Cretaceous. Most of the cavity has developed in massive reef limestone, although there is also a sector where stratified para-reef limestone predominates, especially in the area that extends from the current entrance of the cave to the east. We know that the cave functions as a water collector from two dolines that make up a small polje of 600 x 200 meters; but it is likely that the river basin extends further north. 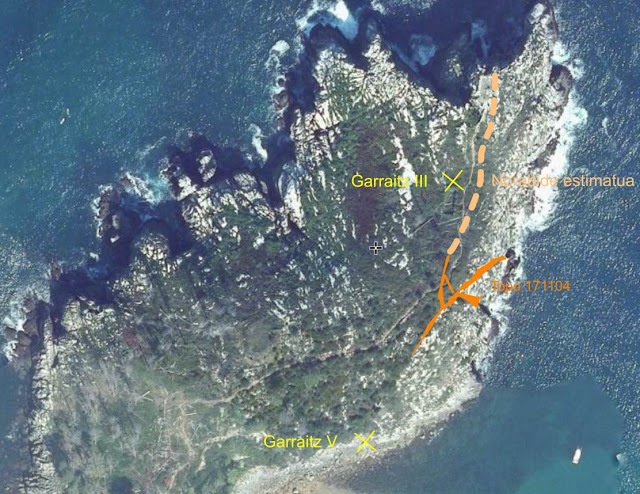 The water reaches the dolines running along impermeable substrates, and is later mostly absorbed by the swallet of Larrotegi that is a few meters from the west end of the cave. The route that the underground river follows from this point is not yet known, and neither is its spring. What is known is that when the water level rises, much of the gallery is flooded. This phenomenon has not come to occur naturally, but due to human activities that have been taking place over the last centuries. Due to its surface and underground characteristics, karst environments are extremely susceptible to change (CALÒ and PARISE, 2006: 48). Depressions, dolines, sinkholes, swallets, pits, etc, all make the karst prone to deterioration and contamination. It is therefore not surprising that ever since humans started inhabiting caves and the karst environments where they are formed, their activity has brought considerable changes to these environments, often exploited excessively and without control, possibly as a consequence of either carelessness or ignorance (Van Beynen, 2011: 351). Human interventions thus produce great changes and degradations in karst environments through mineral, forest and agricultural exploitation; construction; the use of pits as landfills; and so on. All these activities can have negative effects on karst: pollution, depletion of water resources, change of hydrology and morphology of the cavity, disappearance of animal species, etc. (CALÒ and PARISE, 2006: 48). The cave of Armintxe in Lekeitio is a paradigmatic example of this. 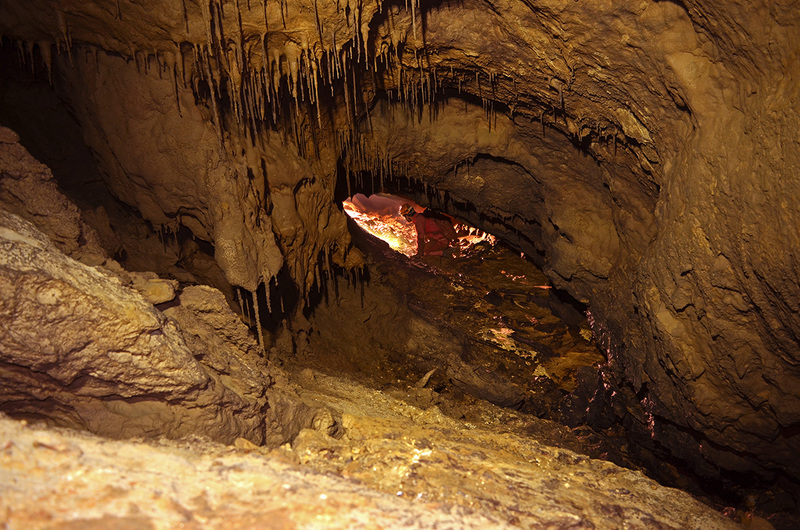 The main feature of the karst where the cavity is located is that it is an "urban karst". This characteristic has conditioned its structure, functioning and morphology, and human interventions have further contributed to this. Being a karstic environment that has an urban development above, the construction and urbanization activities have altered both the surface and subsoil. The karst has therefore undergone a profound transformation: areas of topographical discontinuity (dolines, lapies) have been covered to flatten the land and urbanize it; water courses have been diverted; natural conduits have been used as sewerage; the head of the valley has been used as a landfill for many years; the caves have been used for different economic activities, etc (ADES, 2016). Of all the changes, two are worth highlighting. The first is that in the past, to meet the needs of the neighbourhood, a dam was built inside the cave near the entrance to store and pump water. This produced a large accumulation of sediments in the main gallery of the cave and the subsequent collapse of the duct. Secondly, the construction of houses and urbanization of the surrounding area that took place from the mid-twentieth century had similar consequences. At the time, the entrance of the cave was filled with rubble until it was practically hidden. All these circumstances have profoundly altered the course of the underground river, with episodic inundation of most of the galleries of Armintxe, which has produced among other things the deterioration of a part of the artistic heritage it encloses. 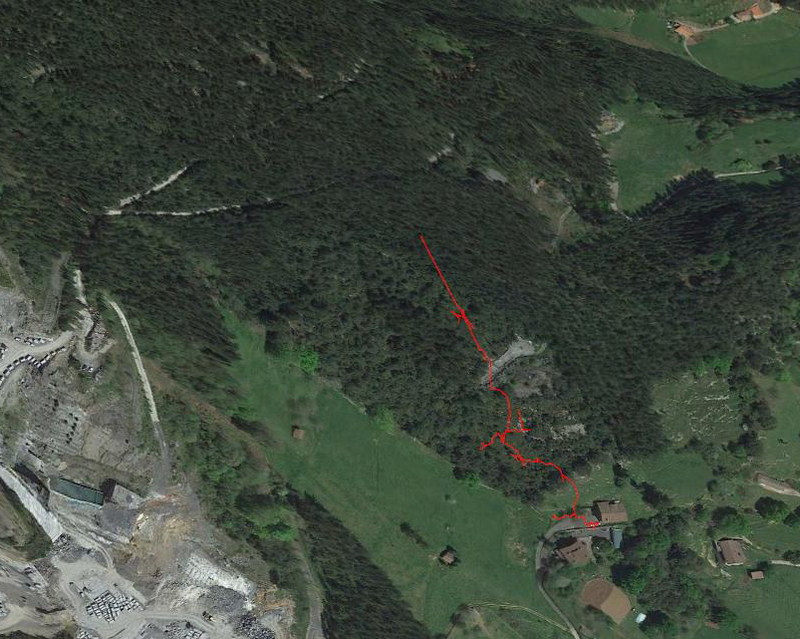 The cave here mentioned was for a while therefore missing, hidden by urbanization works carried out in 2001. It was through testimonies of neighbours and locals that we were made aware of its existence, and it all indicated that the cave in question stood out from others on the hill of Armintxe: this one was a pit where only the bravest dare to go using a rope. The description matched an older reference published on the catalogue of the Grupo Espeleológico Vizcaíno number 796 (GEV, 1985). It was also the neighbours who informed us that the entrance to the cave had been destroyed during the construction of a footpath that connects the neighbourhoods of Larrotegi and Letraukua. "I have been in the grotto or cave of Arbiach, through which apparently runs a great amount of water, but at great depth, from the point where the water runs till the entrance of the cave there is a height of about eighty feet: there is also concern that in times of tidal surges these can come up to the point where the water runs; but even if they didn’t, and even if the water was not so deep, to take it to a point from which it could be led to the Town, it would be necessary to build a Gallery, such as those used in Mines until it meets the water: a very costly enterprise due to the craggy nature of the area - in other words a limestone rock. " At this point it is worth making a toponimic sidenote to highlight that this limestone hill southwest of the town has had several different names throughout history. In the older documents it is designated as Arbeatx, or Arbiatx. In the last century though, the most common denominations for the same hill were Armitxe, Armintxe or Arbintze. 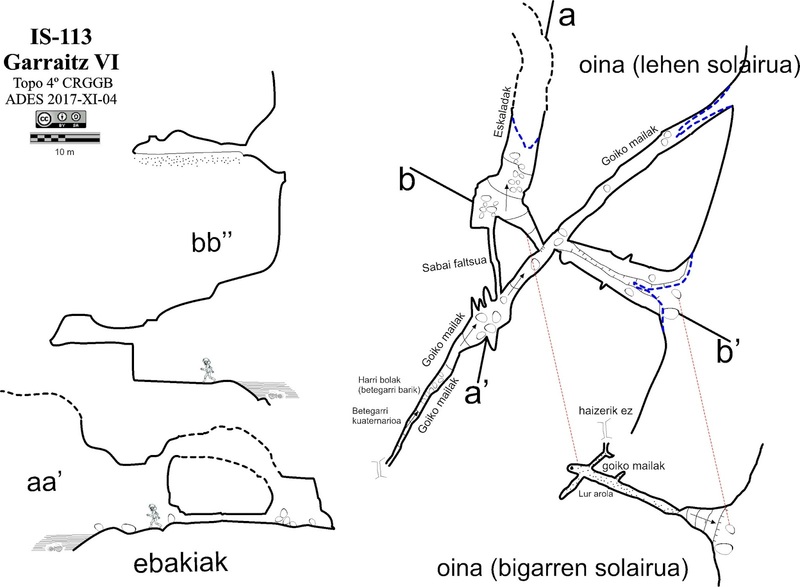 These rural toponyms started losing their relevance as the small allotments and woods developed on the hillside were replaced by building developments and asphalt roads in the neighbourhoods of Letraukua and Aldamiz-Etxebarria. Gradually, the data available to us started coming together. In 2013, one of our informants gave us a detailed explanation of the whereabouts of the cave, with precise geographic references. That was how we first located the cave in the place indicated, on a limestone hillock where it was possible to identify an old gallery filled with earth. There was however an inconvenience: it was right next to a footpath used daily by children on their way to school. For safety reasons, such exploration would have to take place and be completed in one push: it would have to be opened, explored, surveyed, photographed, sampled, and closed, all in the same day. The effort involved seemed too great for the importance that we believed such a cavity could have, after all, we already had many other similar cavities in the area still pending exploration. And so, at the time, we decided to leave it. But things changed. 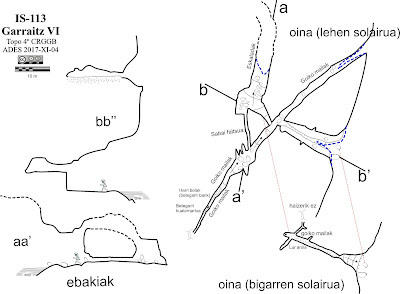 Several discoveries over the last few years (Garratxa I on Lumentxa hill, Askondo, Morgota, Atxurra, etc), and especially the collaborative work carried out between speleologists and archaeologists and sponsored by the Regional Council of Biscay have lead the lower basin of the river Lea to become a place of special interest in the field of parietal art. In this context, the hole covered by the pedestrian roadworks that we had previously neglected gained new relevance. So much so that when we set a date for the opening of the entrance we invited our friends from the Archaeological Association AGIRI to be present, in case we found something interesting. The date was May 1st, and anticipating a tough day ahead of us, we gathered an exceptionally large number of people willing to help. What happened that day is a testament to the work ethic of speleologists. The first stage involved extracting earth, stones, and blocks of concrete, until we opened a narrow passage over the rubble. After successfully going through it, we emerged on the roof of a great gallery, on top of a gigantic pile of rubble. Taking a right, we found the "dreadful" pit that some neighbours used to descend using a thick rope that was still there, placed around a stalagmite. To the left, we descended about 15 meters along a cone of unstable debris until reaching the bottom of the main gallery. 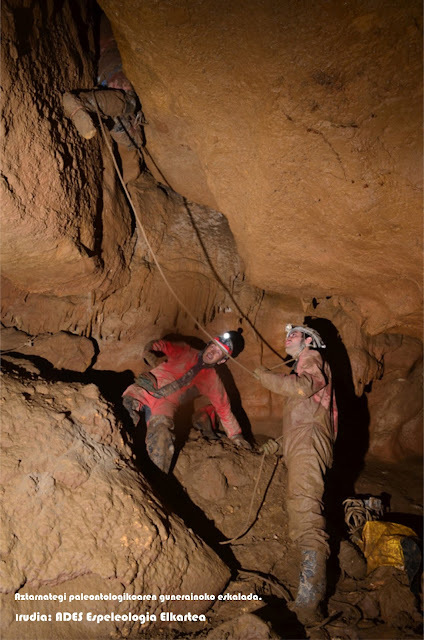 From that point on the cave was fortunately free of debris and each member of the group would proceed with the work assigned to them: exploring the way forward, examining the walls, making the topography, taking samples, photographing. To use the words of the great speleologist Felix Ruiz de Arkaute: "a link by itself is nothing, what matters is the whole chain. " The moment of the discovery was one of conflicting emotions: joy and concern. We immediately understood the extraordinary relevance of some of the engravings and the panel. Some of us have quite graphically described the experience as “a sudden urge to get out”, as if we were desecrating the place just by being there. And that indeed was what we did. On coming upon the finding we immediately headed out in search of the archaeologist of AGIRI to take him to the panel, where he confirmed what we already suspected. We decided to immediately put a stop to the exploration, carefully photographed the panel trying not to touch anything, left the cave and covered and hid the entrance to avoid unwanted intrusions. Of the seven speleologists present that day, the majority have never returned to the engravings’ gallery. Having recovered from the initial shock, our speleological common sense prevailed: we had to carefully carry on with the work. 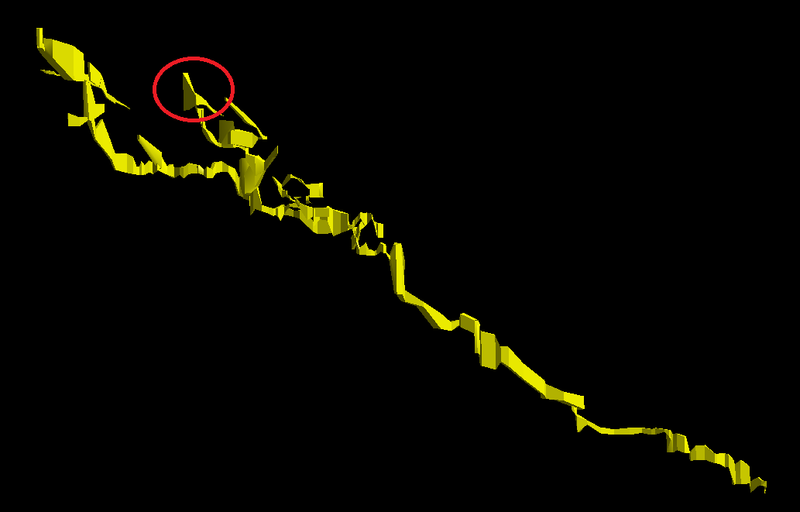 On the day of the discovery we were able to compile a body of data which at the time could not be interpreted, but that became significant as the exploration progressed: for example, that in Erreka Buxatuaren Galeria ("Choked River Gallery", level -1, taking as level 0 that corresponding to the entrance) there were signs of flooding; surprising finding, considering that we didn’t see any river on that level. That same day we noticed that the room with the Main Panel extended in a northwest direction after a squeeze, forming what we have called the ADES Gallery. We observed that there was also a small access to this sector from the corridor called Hondo Bako Galeria ("Bottomless Gallery"). Although both passages were penetrable, we decided not to access that room, which we called Galazotako Gela ("Forbidden Room"). The reason being we suspected that there could be more engravings in it, and that by accessing it through these tight squeezes there was a risk of altering its walls and ground. We believe that this detail speaks to the work and exploration ethics of ADES. The place is still pending exploration, waiting for speleologists and archaeologists, in collaboration, to find a way to study it without putting the archaeological site at risk. There were no entries during the month of May. We must bear in mind that the cave lacked a proper secured entrance and any comings and goings could have attracted undesired attention and unauthorized visitors. By early June the Local Council of Lekeitio had installed a door and our first job was to prepare the cave so that the archaeologists could safely access it, install ropes and ladders along the most difficult stretches, and accompany them to the Panelaren Gela (“Panel Room”). Once these priority tasks had been carried out, the rest of the sectors had to be explored. Apart from the inspection of the first day, we didn’t know anything else about the cave. We established a strict protocol: Armintxe would be explored by a small number of people (with great pain on our part, we had to bar the entrance to many members of ADES); the length of each exploration would be precisely controlled, specifying the minutes spent on each sector; no one would return to Panelaren Gela, unless it was to accompany the specialists (as an indicator of our degree of compliance with this protocol, it is worth mentioning that several of the speleologists who have participated in the exploration of Armintxe have never seen the engravings). The exploration continued on June 25. One pit at a time, we descended to level -2. Aside from a considerable accumulation of sediment and silt in which we sank up to the knees, we made an unexpected finding: an artificial dam. This was a major surprise since it was obvious that during rainfalls both that level and the one immediately above it were flooded. What sense did it make to have a dam down here? We started putting two and two together and currently believe that it could be related to the manuscript of 1796, previously mentioned above. That same day we also found the first engraving of level -1, on the other side of the pile of debris. It was Zaldi Bakartia ("Solitary Horse"), which according to the marks of the wall had been only a few centimetres short of being under water. Interestingly, this horse is looking in the direction of the access corridor to the Galazotako Gela, reinforcing our suspicion that there might be something important in it. We hope to be able to clear this question soon. Another point we would like to highlight (which at a later stage will become of relevance) is that, just like the day of the discovery on the national holiday of May 1st, the subsequent work carried out also took place during national holidays or weekends. We hope this helps clarify that speleology is not our source of income, as our diverse professions can attest to: a brickmaker, a plumber, a cook, a journalist, a draftsman, a lawyer, two geographers, three firemen, three professors, amongst others. During the summer of 2016, therefore, once or twice a week (depending on what the work of each participant allowed), we continued with the exploration of Armintxe: identifying watercourses; detecting anomalies in the circulation of said watercourses; locating paleontological sites; finding traces of an old water mill pump. 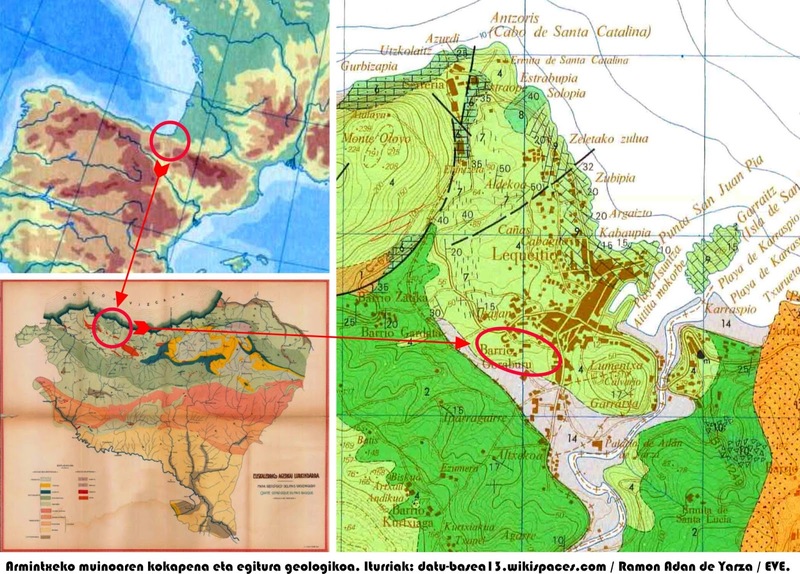 Of all the data collected, we highlighted the evidence of the hydrological problem that threatened the rock engravings. In addition, while we were analysing the geomorphology of the cave (with the help of the Zarama Speleology Group), on August 2 we began to find new engravings on level -1. We soon realised that apart from the aforementioned Zaldi Bakartia, in the Hondo Bako Galeria there was a large number of engravings that had been damaged by the silty water, the reason why we had not seen them at first. Even though during the following days we managed to identify some figures (the majority horses), there were still many that were indiscernible: fragments of animals, isolated lines. The interruption of the work came at a time when the exploration of this sector was in full swing, and so most of the engravings of Hondo Bako Galeria are still pending examination. In fact, a few days later, four months after the discovery, we were forced to interrupt the work due to disagreements with the technicians and archaeologists of the Regional Council. The reasons, as we will see, are not so much to do with the underground world as with an interpretation of the concepts of “amateur” and “professional”. Something that should not be understated is that professionals have specific interests (merits, personal curriculums, publications, job promotions, etc) that do not carry the same weight for amateur speleologists. This is of course something natural and respectable, but it is also something that should be considered as it can influence and affect their relationship with us. During the summer of 2016 the exploration work seemed to be going smoothly and we had six productive weeks. 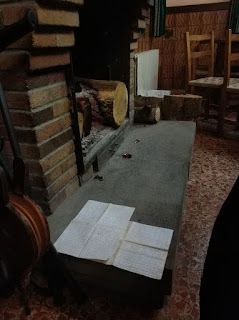 Then unexpectedly, in September, the Regional Council of Biscay denied us access to the keys (that for each entry we had to collect and give back). The reason given was that “the exploration was getting out of hand”, and we were informed that from that moment onwards we were to be accompanied by the archaeologist. We expressed our disagreement: not only do we considered our exploration procedures irreproachable (as previously mentioned we abide to a strict protocol), but we also believe this request evidences a lack of understanding of what speleology entails, given that the act of exploring with the archaeologist is technically impossible. The non-speleologist specialist lacks the necessary preparation to pursue the exploration of a cave, which poses significant danger not only for the non-speleologist specialist (archaeologist or other specialists) but also for the archaeological site itself, since due to their lack of technical skill a non-trained person erodes soils, damages walls, or holds onto places that a speleologist would never touch. In other words: taking the archaeologist with us, besides being of no use to control our work (since he/she cannot get to the places we can), prevents the exploration itself. We organise our own work. As we carry out our work, we identify areas of potential archaeological interest. We lead the archaeologist to those areas and, from that moment only, work in those specific areas under his/her supervision. This system and no other is what has enabled the discovery of rock art sites such as Santimamiñe, Morgota, Atxurra, and even Armintxe (bear in mind that on the day of the discovery we were the ones who invited archaeologists to be present, and that we were the ones who decided to take the first measures to protect the room with the engravings). The most serious incident would come in October, when the Regional Council publicly presented the finding. To our surprise, the press release distributed for this purpose made no mention of the speleologists. To make matters worse, during the press conference the discovery was then attributed to the Regional Council of Biscay. 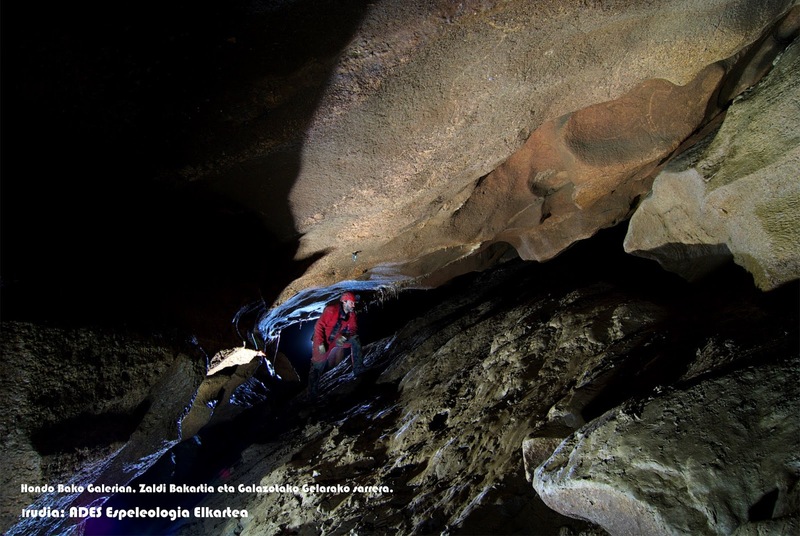 The only mention of the speleologists was made by the archaeologist César González in the final part of the presentation. This only served to aggravate a situation that was already tense. The journalists, however, were quick to pick up that something was amiss. Following the archaeologist’s final mention, some of them took interest in us and, during the following days, various media would report our discomfort with how things had unfolded. At the end of the event, we made a complaint to the Regional Council Press Office. They admitted their error, and for our part we do not believe that there was any bad faith; they had simply followed the standard procedure, which consists of giving prominence to the “managers of the house” and to relegate the discoverers to the background. In the upcoming days, several speleology groups came forward to show their support and expressed having experienced similar situations. A more unusual thing also happened: this ignoring and relegating of speleologists to the background, which usually stays in the private sphere, came to the public light, arousing a great deal of interest and indignation within the non-specialist public. We, speleologists, have always shown great sensibility towards the heritage of caves (ARRIZABALAGA, 1994), and that is why we have extensively collaborated with specialists in the past, still do it now, and will most certainly continue doing so in the future. However, keep in mind that there are no professionals who dominate all aspects of the karst. Specialists are generally from a single discipline, which has sometimes lent itself to disastrous consequences: beginning archaeological excavations in a cave and depleting its fauna; scanning a rock art panel with state-of-the-art technology and damaging the site at ground level; just to name a few. It is rarer for such things to occur among amateur speleologists, since among us there are specialists from all branches who study the karst: some professionals (as previously shown through our diverse list of occupations), and the majority self-taught. In addition, if the group lacks a specialist in any given discipline, speleologists usually turn to other neighbouring groups, from which they can usually promptly access an expert on the subject. This is the usual work procedure of amateur speleologists, which unlike what happens with professional speleologists, allows us to simultaneously address several lines of research that should be considered when studying the karst. 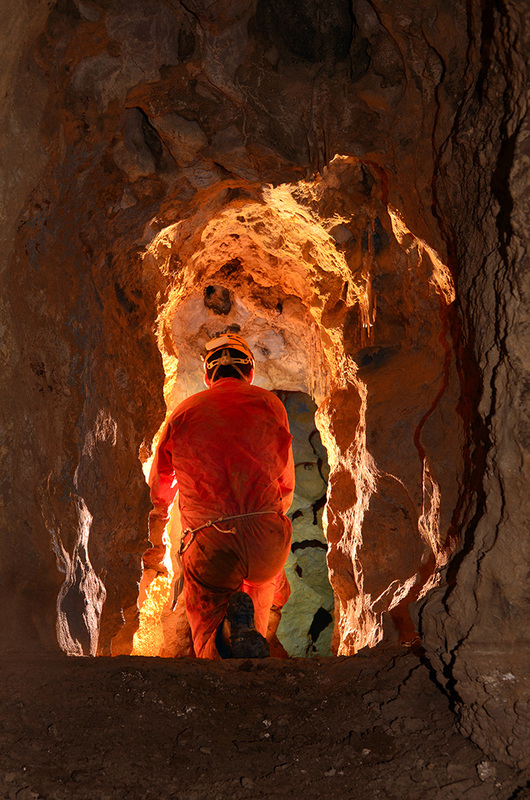 Until now, whenever speleologists have made a discovery - a relatively frequent occurrence - we have almost always been left in the shadow of professionals and institutions. This is something that has never mattered much because we are concerned for the knowledge and the protection of karst, not for the glory. However, there has been a substantial change in recent years. Until now, most of the deposits were located near the entrance of caves and access to the workplace was easy. This meant that if the Administration or the professionals had any discrepancy with the speleologists, they could simply do away with us and carry on with their work without problems. But the situation has changed. 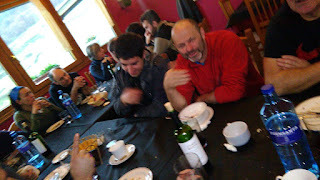 The archaeological sites that we are now finding (paradoxically, thanks to the training provided by the Regional Council of Biscay) are no longer in easily accessible places and require the collaboration of speleologists. That is why, from now on, our opinion should begin to be respected. 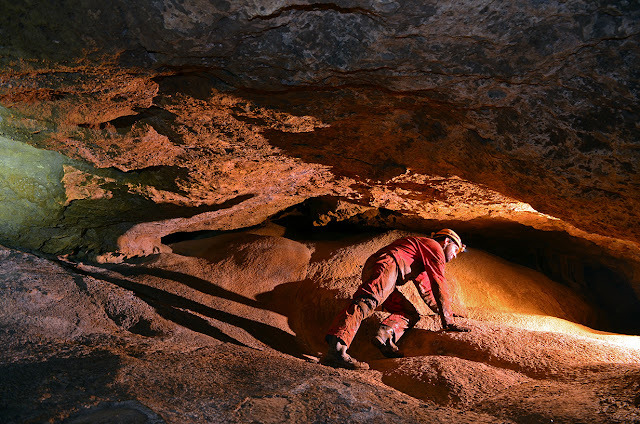 What is more, the cave of Armintxe presents a distinct difference from previous ones: the archaeological site has been discovered in a completely "new" cave, that is to say, of which nothing is known: how it is; how it develops; how it works. This information is fundamental since it affects the work of speleologists and the role we have in contextualizing the finding. It is of utmost importance to carry on with the exploration and compile information about this cave so that it is clear, for all those involved, exactly in what environment we are moving and what potential risks the engravings face. 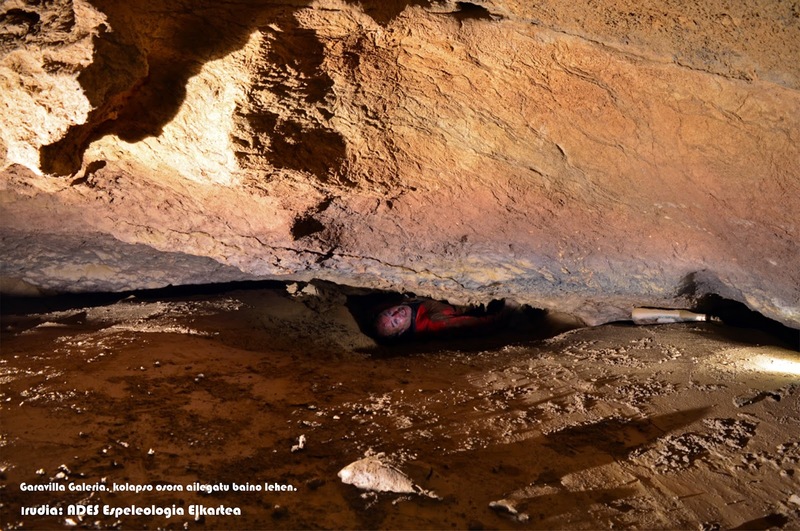 One year after the discovery, and due to the impediments placed on speleologists to continue the exploration, the environment in which the site is located is still unknown. At this point it is perhaps advisable to contextualise things, since this confrontation of sorts with ADES is but the latest episode of a longstanding problem between speleologists in general and Administration. In general, institutions have never been very clear of where to place speleologists. As previously mentioned, most of us are self-taught and amateurs. The Administration works mainly with career officials, certified consultants, subcontractors, and is not used to dealing with informal groups. On the other hand, the disciplines that we investigate are not ascribed to a single department: some fall within the purview of Environment (hydrology, biology, etc), others Public Works (geomorphology, topography), others Police Forces (rescue), others Culture (Archaeology). This means that our activities in the karst fall under the purview of various institutions, which at times is complicated to coordinate, especially if some of them are not accustomed to collaborating with each other. Of no less importance are territorial limits, which are completely ignored by water (it is very common for a watershed located in one province to pour its waters into another, sometimes even into another administrative region). As can be seen, speleology does not easily just fit within conventional work schemes. Despite this, we are certain that we will continue collaborating with institutions (Regional Councils, Governments, Universities, etc). At this point it is they who need to consider the new situation (archaeological sites at greater depth). What role will speleologists have in these collaborative teams? Since the unfortunate press conference, and up until the writing of this article, the Management of the archaeological site of Armintxe has not contacted ADES regarding any work to be carried out inside the cave. There have a few kafkaesque situations. We will not dwell on details, so as not to embarrass anyone, but we can mention a few things: the contradictory attitude of the Administration (with bosses who repeatedly give us reason, and subordinates who continue to prevent us from doing our work); that ADES has presented in writing its work plan which, after being approved, was then awarded to a private company; that after being barred entry (arguing that we could damage the site), some journalists and specialists entered the cave without respecting the famous protection protocol. In theory, speleologists are now awaiting the scheduling of the works. In the last meetings with the Management of the archaeological site, we were informed that they are still counting on us to finish the exploration of the cave. In the meantime, ADES is continuing with the study of the karst in question, both on the surface and inside other cavities of the area (which are numerous, as can be seen from the code that our catalogue assigns to this cave: IS-100 Armintxe II "), and is collecting new data of great value to understand the complex hydrogeology of the hill, which will give rise to new works. On the other hand, we are aware that works are currently being carried out inside the cave (archaeology, geology, sedimentology, photogrammetry, etc) but despite having shown interest in these, we have not received any information about these developments. At present, speleologists and other specialists are working without any sort of communication and exchange of information. 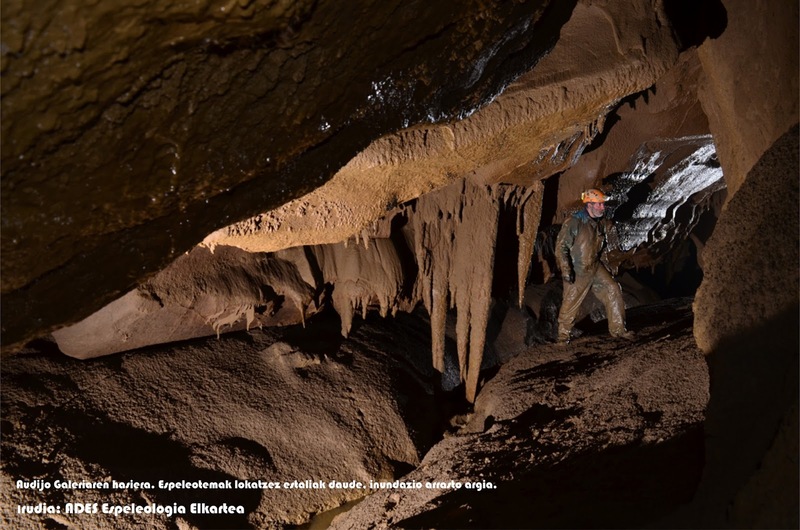 A somewhat absurd situation, since as previously mentioned, to address the serious problems that pose a threat to the archaeological site, it is of utmost importance to study the Karst of Armintxe in its entirety. We are optimistic though, and believe that common sense will prevail and that the Administration and the Archaeological Management will consider speleologists as something more than simple helpers for small D.I.Y jobs. For the reasons here described, we advocate that speleologists should join the management team for the works being carried out in Armintxe, in the capacity of specialists of the comprehensive study of the karst. It is therefore clear that from this point forward, the collaboration of speleologists will be essential for the study of archaeological sites at depth. However, we should not be tempted to see that as allowing us to behave as knows-it-all; professionals are still the highest authority in their field of expertise and it is not up to us to tell them how to do their job. Instead, if what we seek is mutual respect and recognition, we can start by addressing one of the biggest reasons for distrust towards us. It is a known fact that professionals criticize us because the informal nature of caving groups allows anyone (in the worst sense) to enter them. It is a logical mistrust. This said, it must be pointed out that caving groups have their own self-regulatory systems. 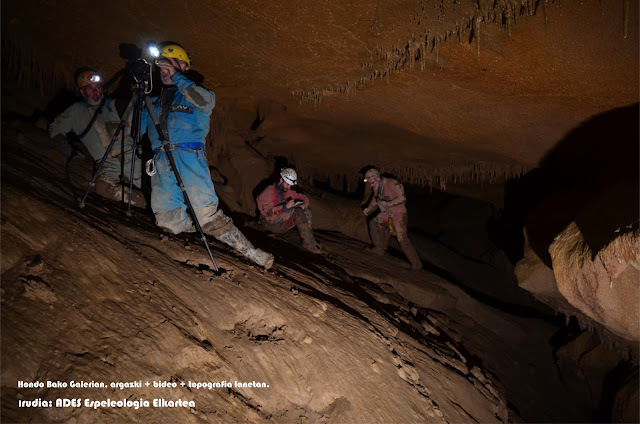 At least in groups that are dedicated to scientific speleology, there is an ethos and a tradition, and experience tells us that people who do not share this ethos (adventurers, scavengers, vandals) are usually closely watched and their time in these groups is short lived. The answer is therefore to refine these systems of self-regulation. We must make the behaviour of speleologists exemplary: we must be more professional than the professionals, so to speak. And this in all the disciplines that converge in the karst (not only archaeology), since it is precisely in this multidisciplinary dimension of speleology that its strength lies. 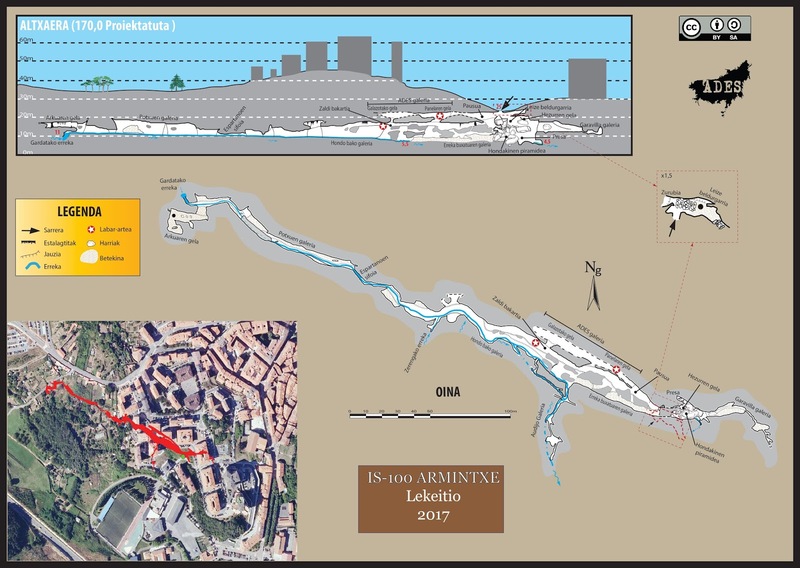 With no wish to dwell on this matter any further, and trusting that there is goodwill from all parts in seeking a resolution to the Armintxe conflict, we would instead like to focus on the most problem at hand: the periodic floods that threaten the archaeological site. As mentioned in the geographic and geological sections, human activity on the hill of Armintxe has significantly changed the behaviour of its underground water system. This problem, which is in itself serious, acquires alarming proportions in what concerns this collection of parietal art. We believe that the first influencing factor was the dam. Despite having no factual evidence of its exact date, we suspect it to have been built in the 19th century. The dam reduced the speed of the watercourse, and the loss of inertia facilitated the accumulation of sediments which in turn filled the river bed to a height of 12m. The dam is obstructing the main gallery but, unfortunately, we were unable to examine the back of it because due to the construction works of 2001 both the reservoir and the section of the rear gallery are blocked by debris. Following the construction of the dam there was an increase of water circulation in Garavilla Gallery (14m), and as a consequence this part has also seen an accumulation of sediments (until its total blockage in 2008, due to the construction of a block of garages). In the 1950s there were two urban developments: the educational-sports complex on the southwest plains, and the Aldamiz-Etxebarria neighbourhood on the northwest side of the hill. We believe these works caused a deviation in the watercourse that enters Armintxe from a place called Audijo, and which subsequently was the reason for water to disappear from Audijo Gallery. In the 1980s the eastern side of Armintxe was urbanized. One of the new developments had its sewage diverted to a pit, topographically located over the Garavilla Gallery. According to the testimony of the neighbours, the pit did not have the capacity to absorb the residues that the fifteen floors produced, and the basements of the building were flooded with sewage waters to the point of starting to damage the structure of the building. This situation, of course, contributed to the choking of Garavilla Gallery. Fortunately, the wastewater was eventually diverted to the sewerage system. At present this pit is accessible, and is under exploration. Around the year 2000, the ground in a garage of building number 22 in Atea street, sank when the vault ceiling of an old underground artificial gallery gave in. The owners of the premises covered the sinkhole, blocking the passage of the stream. According to our informants it was from that moment that, in times of torrential rains, the water began to emerge from the opposite side of the hill (the point corresponding to the end of the gallery of Audijo), beginning the periodic floods of the school complex. 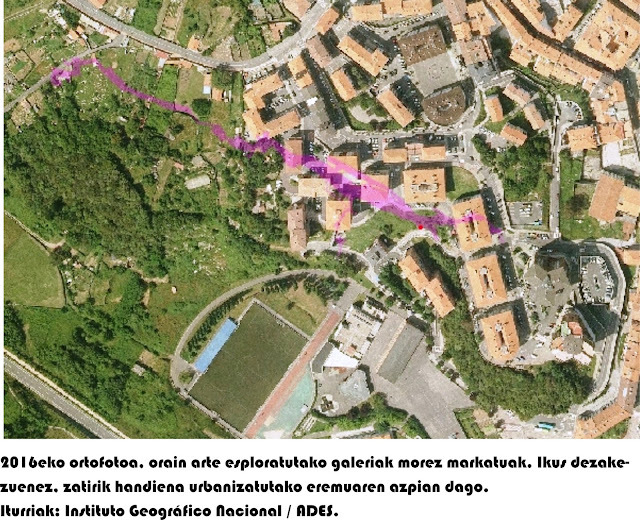 In 2001, coinciding with the construction of four blocks of Council Housing, a new footpath was built connecting the neighbourhoods of Larrotegi and Letraukua, which destroyed the entrance of the cave of Armintxe by filling it with debris. The work was carried out without any archaeological impact assessment. In addition, the rainwater drainage for the footpath was directed into the cave itself, thus creating a new water course in it which now crosses the entrance hall and is eroding sediments of archaeological potential. Lastly, in 2008, a carpark complex was built in what used to be the site of the old Garavilla cannery. In its day, GEV had catalogued a cavity in those lands (Garavilla II, ref. 1031), indicating that water came out of intermittently. One of the galleries of the cave of Armintxe has led us to a topographical point very close to this place and we are led to believe that this is the exact point GEV makes mention to and that functions as a trop plein, or water outlet. Nowadays, the circulation of the river through the main gallery is completely blocked. Therefore, every year during the rainy season, the water level rises from its usual level of 8m to at least 20m. At that moment, with the water 5m above what is the level of Audijo Gallery, the latter begins to act as a trop plein, discharging the water in the opposite direction of its usual circulation, and flooding the educational complex. Needless to say that when this happens, Hondo Bako Galeria is filled with muddy water, with the consequent deterioration of its engravings. The end of this vicious circle is, of course, collapse. As has already happened in other sectors, as ducts become progressively obstructed, the water will seek a new way out of the cave, and when it finds it, the consequences will be unpredictable: floods, landslides, etc. Meanwhile, the deterioration of the parietal art will continue: the engravings below the flood level will be submerged annually in muddy water, and the progressive accumulation of sediment will raise the water level until it reaches the engravings that have so far survived. Without a doubt, the most important line of work in Armintxe is the archaeological one. In this regard we cannot advance much, since the procedure is running in reverse order to what is usual, ie discovery> research> presentation. In this case, the sequence that has been followed is discovery> presentation> investigation, so it may be a while before we can handle accurate data. Everything we say in the meantime will remain in the speculative field. It must be said that, apart from the unusual features of some of the engravings (claviforms, lions, etc) this finding is striking because of the quality of the images. Most of the engravings found during the last years are difficult to see with the naked eye: it is necessary to light them obliquely, and sometimes to use computer programs to the effect. However, in Armintxe many of the engravings can be appreciated with the naked eye. Without disregarding its archaeological significance, this fact undoubtedly contributed to the finding gaining greater diffusion. We should also bear in mind that although the focus has been the Main Panel, there is art in Hondo Bako Galeria that has not even been catalogued yet (as mentioned before, the exploration of this sector was in full swing when we were ordered to stop our work). When the time comes to resume the study, the best thing to do is to direct our efforts to solve the flood problem. In the meantime that is what ADES has been working on, with special dedication to the hydrographic study of the hill of Armintxe and its surrounding areas. The archaeological excavation on the floor of the cave will also be of importance, as it may contain information about the authors of the engravings. As mentioned above, we are aware that the archaeologists have conducted some surveys and that the company commissioned with the geological study has also carried out some work. However, we have not been part of the collaborative work, or perhaps we should say that although ADES has been asked to participate, the conditions offered did not allow us to conduct our work properly (and to do things poorly, we prefer not to do them at all). Apart from the main archaeological and hydrological issues, during the 6 weeks we were able to work inside the cave we collected information on the usual fields: photography, geomorphology (with the help of the Zarama Speleological Group), history (a field not very usual, but crucial in the investigation of the karst of Lekeitio) and biospeleology. 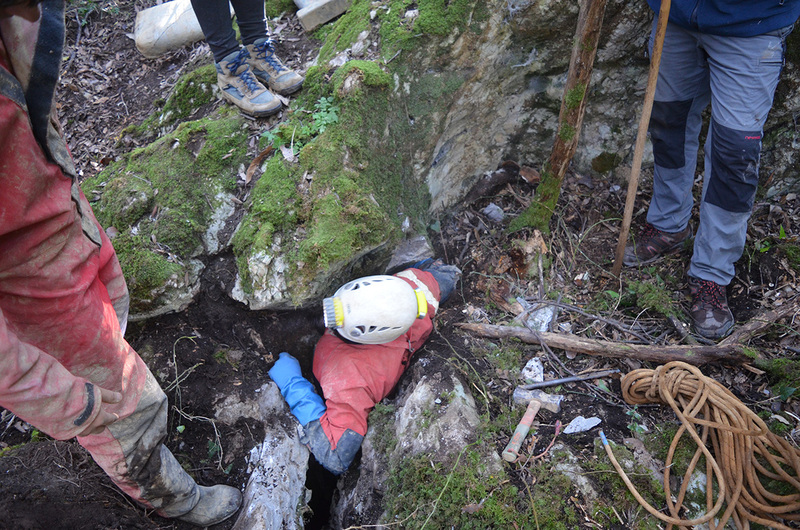 On the latter, the biological samples collected in Armintxe have been sent for identification to Carlos Prieto (member of GAES Speleology Group, and professor of the Department of Zoology of the University of the Basque Country). Despite not having all the results back yet, we can say that Dr. Prieto has already identified a number of troglobic species: Quaestus (Quaestulus) noltei, Neobisium (Blothrus) sp., Campodeidae, and Kylopodia (Lithobiidae). 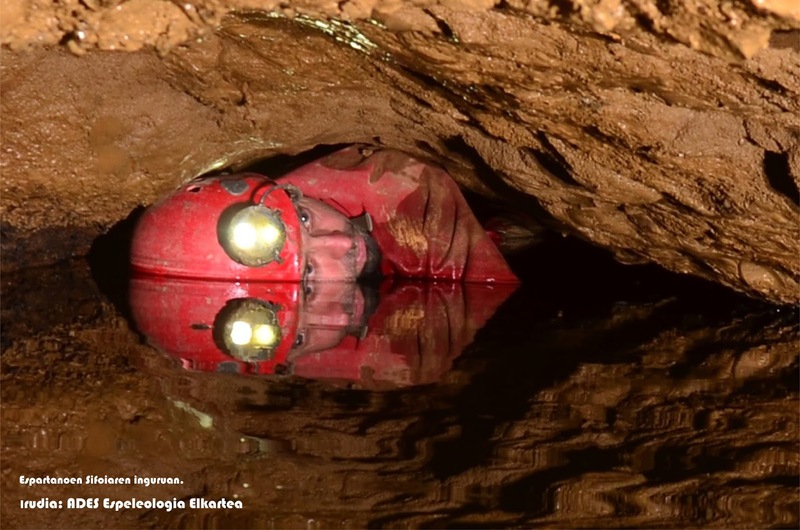 In order to solve the problem of the flooding that is endangering the engravings of Armintxe, it is necessary to come to understand the hydrogeological behaviour of the karst as a whole. 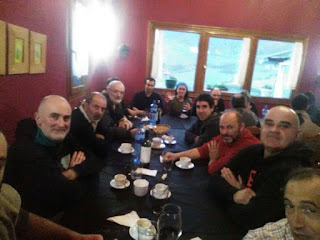 To this end, the ADES Speleological Group needs autonomy to organize its work plan and coordinate it with the Management of the archaeological site - as per indicated by the Regional Council of Vizcaya, in the person of the Head of Service of Cultural Heritage, who agreed with our request. Time is ticking, with each rainy season the galleries with rock engravings are being flooded, and at the time of writing this article that agreement has yet to materialize and be put to practice. Speleologists, professionals and Administration are forced to come to an understanding. There is simply no other option. What we do have the power to decide is if we will come to an understanding quickly, or not. The longer we take, the worse it will be for the engravings. • ADES ESPELEOLOGIA ELKARTEA. 1982-2017. Esplorazio egutegiak. Unpublished. • ADES ESPELEOLOGIA ELKARTEA. 2016. Informe sobre las aguas de Larrotegi. Unpublished. • ÁLVAREZ, Ángel. 1986. Informe hidrológico de las dolinas de Larrotegi. GEV. Bilbao. Unpublished. • ARRIZABALAGA, Álvaro. 1994. Algunos apuntes sobre la toma de datos de interés arqueológico en la actividad del espeleólogo. Karaitza (Unión de Espeleólogos Vascos magazine)3:15-22. Oñati. • AYUNTAMIENTO DE LEKEITIO. 1786-1894. Informes sobre Aguas de Lekeitio. Unpublished. • GEV. 1985. Catálogo de cuevas de Vizcaya. Diputación Foral de Vizcaya, Bilbao. • GIGSA. 1986. Informe geológico sobre el municipio de Lekeitio. Unpublished. • OCAMICA Y GOITISOLO, Francisco de. 1965. La villa de Lequeitio. 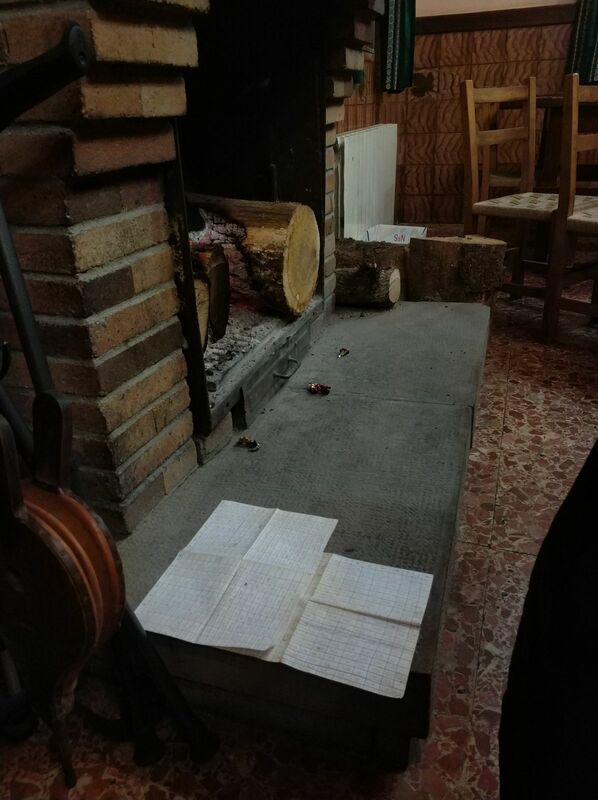 Ensayo histórico. 2º edición. Diputación Foral de Vizcaya, Bilbao 1966. Garraitz VI. Hillabetez kueba bat zapaldu barik egon ostian, ezin tentaldixari eutsi eta zulo honi begiradia botatzera juan naiz. Bistan danez, bakarrik egotian, seguridade arauak zorrotz baiño zorrotzago beteta, eta arrisku minimorik hartu barik. Arrakalian bertizian kabezera bat instalau dot (punto 2; bertikal horixe izan da UTM koordenadetan jasotakua, eta piso bixen topografien 00 abiapuntua), eta hortik behera “aluan klitorisa” begiratu dot lehelengo. Uste nebana baiño desarrollo gehixago zekan: 15 bat metrotako galerixia, 4garren metrotik barrura lur harro-harroz beteta, total birjiña; kontu haundiz, lur azala eta hormak miatuz (ez dot aztarna nabarmenik ikusi, mamifero txiki batzunak bakarrik), barruraiñok sartu naiz, azken estuasun batian (haize bakua) geldittu arte. Lehentasuna behekuak zekanez (ixa maria beherako ordua zanez, ordu 2 bakarrik nittuan), behera jaitsi naiz eta gero gorakuan topografiau dot. Beheraiñok allegauta, esan bihar dot uste nebana baiño haundixagua dala zulua; enbarkaziñotik eta batez be maria goran, ez dau hainbestekua emoten. Lehelengo biharra zuluan ikustaldixa egittia izan da, topo puntu posibliak harrapatuz: frakturak kruzau egitten badira be, barrurakako norabide nagusixa sarrerakua da, NW; gela txiki baten (4x6x2,5), jarraitzeko norabide nagusi bi dagoz (baitta goraka trepadan segitzeko be; hori ez dot begiratu); SW norabidian, galeria txiki bat dago, gero eta estuagua bihurtzen dana, eta estuasun baten amaitzen dabena; NNE norabidian, ostera, pasabide baju batetik galerixa haundi batera allegau naiz (6x10x16), eta hor ura topau dot; hortik aurrera, galerixiak aurrera egitten dau (ez da kanpoko argirik ikusten), baiña oposiziñuan edota igarixan segidu bihar danez, geldittu egin naiz; era berian, ibilbidian zihar eta galerixa honetan gorutz segitzeko aukeria ikusten da; ondo esploratzera etortziak merezi dau, duda barik. Ahal izan doten moduan horraiñoko topografixia egin dot, eta hanka. PD: topuan datuak pasau eta gero, datu pare bat: beheko maillan rekorriduan 1/3 bat baiño ez dot egin; eta itxura guztien arabera, NNW norabidian segitzian IS-077 Garraitz III zulo puzkarixan bertikaletik pasauko gara; eta SW norabideko galerixiak Garraitz V-eko formaziñuekin harremana izan leike.